[updated September 2012] The main reason for the creation of the International Vegetarian Union, way back in 1908, was simply to help veg*ns in different countries communicate with each other. This was done mostly by exchanging newsletters, journals and personal letters - but there was no substitute for real face-to-face meetings with people of diverse cultures, languages and cuisines. IVU was founded at such a gathering and they have continued ever since. For about the last 15 years we have seen a vast communications transformation. Thanks to the internet we can now have real-time, anytime, talks with anyone, anywhere in the world - even with live video links. And yet... there is still no substitute for actually meeting in the flesh. Sitting around a meal table where everyone comes from a different country is a unique experience, and for veg*ns there is a special significance in sharing our plant foods (all congresses always have completely vegan food). However we do, of course, have to be aware of the environmental impact of travelling to other countries, and IVU today is reluctant to encourage large numbers to fly halfway around the world to attend global gatherings. One alternative is an increase in regional or sub-regional meetings, so that it becomes much easier to travel by more environmentally friendly means, such as rail or ship. There will, of course, always be those who want to visit far-flung places, and it has to be a matter for each individual to decide how to balance their own decisions. right: the IVU stall in Xiamen, China. Susianto and myself talking to leaders of an IVU member society from Mongolia. center: musicians at the world veg congress in Goa, India. right: Sandhya Prakash meets a local visitor the Middle East veg conference in Dubai (UAE) - and Sister Wako Ishikawa from Japan speaking at the IVU centenary congress in Dresden, Germany. left: a speaker in the Chinese lecture room in Xiamen, China. right: some of the audience, with headphones, for my talk at the international forum in China. Below is a summary of what is happening in each of these regions, do come and join us at any of them! - see the link at the bottom for more details. We'll soon be welcoming people from many countries to the 40th IVU World Congress.Vegfest in San Francisco and Los Angeles, October 5-14 2012. The first IVU World Veg Congress on the West Coast. This one is the turning point - the last of biennial Congresses and the first of the annual Vegfests. Many IVU member groups in North America organize major annual events, see the link at the bottom. 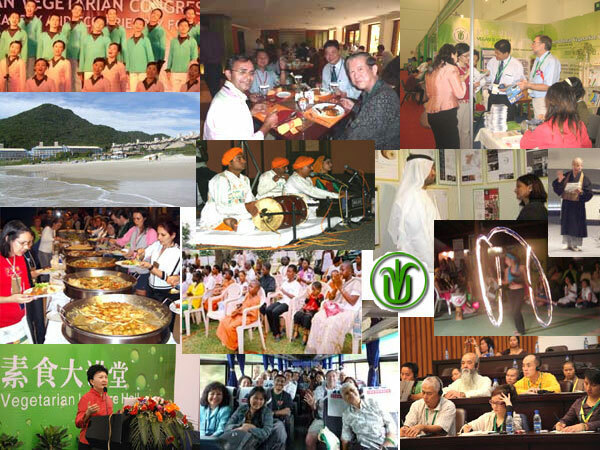 The first world veg congress in eastern Asia was Chiang Mai, Thailand in 1999, followed by regional events in Bangkok, Taiwan, Indonesia and China - and the 39th World Veg Congress in Indonesia in 2010. There will be a South-East Asia Veg Congress in Chiang Mai, Thailand in October 23-25. 2012, see the link below. For those wanting to extend the trip, there will be a vegan festival in India the previous weekend - September 27-29. Right: the twin towers in Kuala Lumpur, previously the world's tallest building, now overtaken by Shanghai and Dubai. The first ever veg congress in Africa was for West Africa in Lagos, Nigeria in 2007; followed by Accra, Ghana in 2009 and one for East Africa in Nairobi, Kenya, 2010. November 23-25, 2012, there will be a Congress in Lome, Togo - mainly for West Africa but we hope to attract others from across the continent, making it the first Pan-Africa event. In 2014 we will have the first ever World Congress/Vegfest in Africa - the 42nd, either in Nairobi or Accra, to be decided soon. Right: A giraffe at Nairobi National Park, with Nairobi's skyline in background - and below the beach at Acrra, Ghana. Latin America led the way with regional veg congresses, hosting the first in Venezuela, way back in 1972. Our first Latin American world congress was in Brazil in 2004. The 43rd IVU World Congress/Vegfest - 2015 - will be in Latin America - Paraguay and Argentina are both keen to host it. A decision will be made soon. The first IVU congress in India was in 1957, and we've been back many times. 2010 saw the first Middle East Veg Congress in Dubai, United Arab Emirates, repeated in 2011, and a regional Congress in Bangalore, India. There will be a 3rd Middle East VegFest in Dubai in December 21/22, 2012 - and the vegan festival in India, September 2013, mentioned above. The 44th IVU World Veg Congress/Vegfest -2016 - will be in the region - possibly in Dubai for the first ever world veg event in the Middle East. Europe has a long history of veg events, including the centenary IVU World Veg Congress, in Dresden, Germany, 2008. There are plans for a regional Euro Veg Congress in Greece in 2014. For the 45th IVU World Congress/Vegfest -2017 - we plan to go to Eastern Europe - Poland is being discussed as a possible location.